-Up to 72 hours before arrival and for cancellations higher than 10% of the total of the rooms, the same cancellation fees would apply as in the case of total cancellation of the event. -In the 72 hours before arrival and no show for any cancellation of rooms will be charged 100% of the cancellation fee. The Hotel must receive the final rooming list 1 week before the arrival date. No-Shows will be billed for the total stay. Check-in starts by 3pm, we need to know in advance in case you plan to arrive with the group before that time. On arrival it is compulsory to deposit 10€ per person in cash as bond for the rooms, on departure rooms will be reviewed and deposit returned if no damage was located. One week before arrival we would need a copy of all passports/ID of the persons assigned to this group to speed up the check-in process. 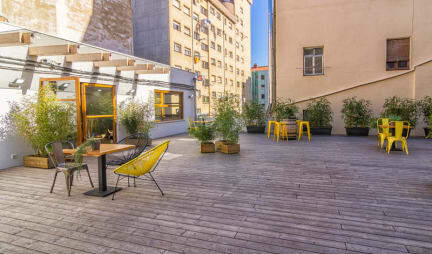 Bcool Bilbao is a cutting edge technology and modern hostel premiered in one of the most fashionable quarters of Bilbao. We are located in a historical edifice, which has been revamped to adapt it to the necessities of the modern travellers and guests. If you are looking for shared rooms or a private suite for couples, this is going to be your best choice. Economical, original and full of supertravellers! We are located in one of the best and most popular neighborhoods of Bilbao named 'La Vieja'. We are just a few minutes away walking from La Ria de Bilbao and some minutes away from some of the finest landmarks of the city such as Museo de Reproducciones Artísticas, Txakurraren Iturria and Euskal Museoa Bilbao Museo Vasco. In addition, some minutes away from our facilities on foot you can find several metro ans bus stops so you can get them to explore the city and beyond. We offer different types of accommodation options for diverse sort of travellers and guests. We are oriented mainly to travellers and backpackers and that is why we offer a vast range of dorms for those venturesome travellers who likes to travel with comfort and economizing their resources. In addition, we have a suite ideal for couples who are looking for quietness and tranquility. Breakfast not included - 4.00 EUR per person per day. The reception service is open 24 hours per day. It was a very good hostel. Booked it because it was the cheapest hostel in Bilbao, but I think it also was the best! Close to the citycentre, clean facilities, free drink when you arrive and the beds were great! It also looked very good and inviting. Had a great stay! Nice hostel with really nice beds. Lot of privacy. Clean showers. The hostel is located in a quiet shady neighbourhood. Fine during the day, but at night there are a lot of men on the streets hanging. Wouldn't wanna walk there as a woman by myself. Wouldn't recomment it either! So if you're a female solo traveler, find yourself some company to walk you back to the hostel. Geweldig verblijf gehad, super vriendelijk personeel!! Nadeel was alleen dat niet elk bed een stekker heeft om op te laden. Mooi en nieuw hostel!! Aanrader!! It is a very nice hostel, but the (ladies) bathroom was a mess. Also the neighborhood doesn't feel the safest, but as long as you are not outside there alone at night, it is okay. General pleasant stay! The hostel is new, clean, and all the facilities are fine. Negative things about the hostel are the neighbourhood it is located in, which is called San Francisco and is a real Spanish ghetto. You immediately notice this, as there is a lot of (immigrant) people on the street, making noise and selling things. It makes you feel unsafe to get back to the hostle late. Furthermore, the hostel charges prices for breakfast and drinks, which are higher than prices at bars, and the breakfast is poor. Non co-operating while making a mistake in the booking which was clearly a non possible booking, they are just there to collect the money. Breakfast very overpaid, not worthed, but also a way to make the stay look cheaper. Runned as a business, very unpersonal and lacked the spirit of a hostel run by people that have a heart for hospitality unfortunately.